If you haven’t jumped on the coconut oil band wagon yet, its probably best you do so because you’re missing out if you don’t! 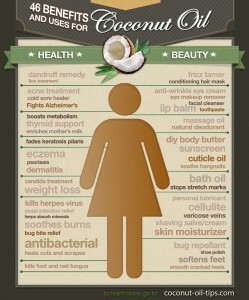 Coconut oil is the most amazing multitaskable health & beauty product out there. It’s actually really funny because I literally use it for everything. No but really, EVERYTHING! I literally don’t spend any money on moisturizers and all these creams with chemicals in them. I realized a long time ago that all these products I was spending hundred of dollars on just wouldn’t cut it for me. 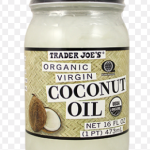 Everything made me break out and even things that were dermatologist recommended were making me break out, so one day someone told me about coconut oil and BOOM! Problem solved! 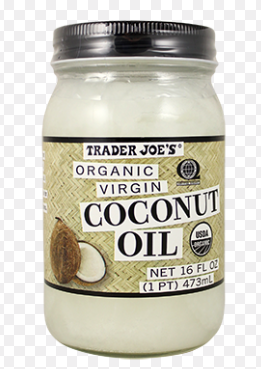 I no longer spend money on those things and I use my Trader Joe’s Extra Virgin Coconut Oil or my Kelapoo Extra Virgin Coconut Oil (these are my favorites but there are many different brands out there). Make sure if you buy, it’s extra virgin and Organic. The only ingredient should be cold pressed coconut oil. I also use coconut oil to cook, some worry about the coconut flavor in all their foods but honestly you can barely tell. It usually does not taste like coconut unless you purposely used a ton for the flavor. Also, throw it in your smoothie! Like I said if you’re not into the flavor trust me, you won’t taste it. 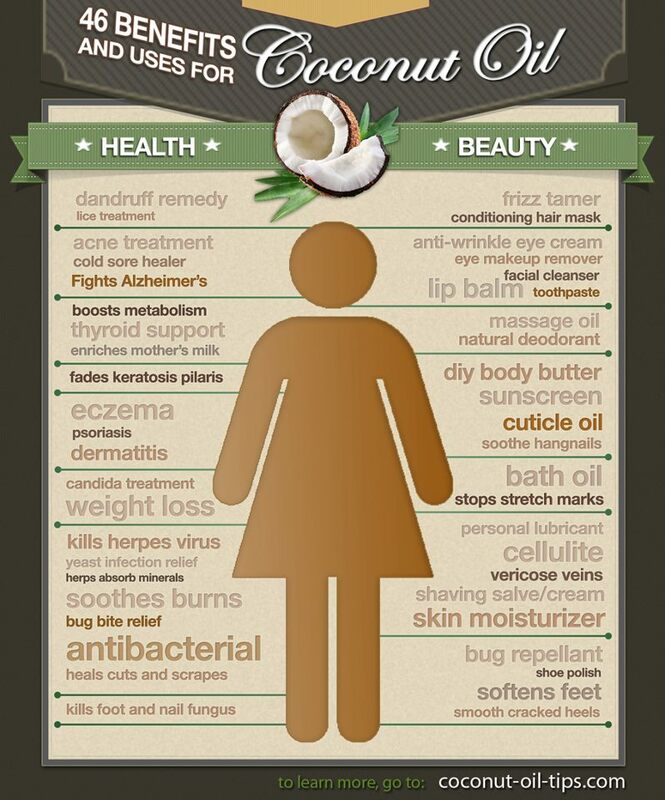 Coconut oil does your body good inside and out. I already use coconut oil on my body as moisturizer but I have been applying extra on my belly and hips to prevent stretch marks. I do plan on using coconut oil for my baby as well. I will be replacing baby powder with it and diaper rash cream because it works better than a powder and plus baby powder has a ton of chemicals unless you get one that is organically made. But, since I use coconut oil for everything else, why not just continue!? Summer is coming and you wanna know what? Forget Aloe vera gels! Unless you are using a real plant then thats fine but if you want a quick sun burn relief and cure, get your self some coconut oil! It works wonders and the extra moisturizing is a plus! Ok, I am going to share with you my favorite go-to recipe, its super duper easy and healthy! I promise, you just need a few things and you can throw a family meal together in no time! There are many variations so you can make your own version by adding more ingredients. 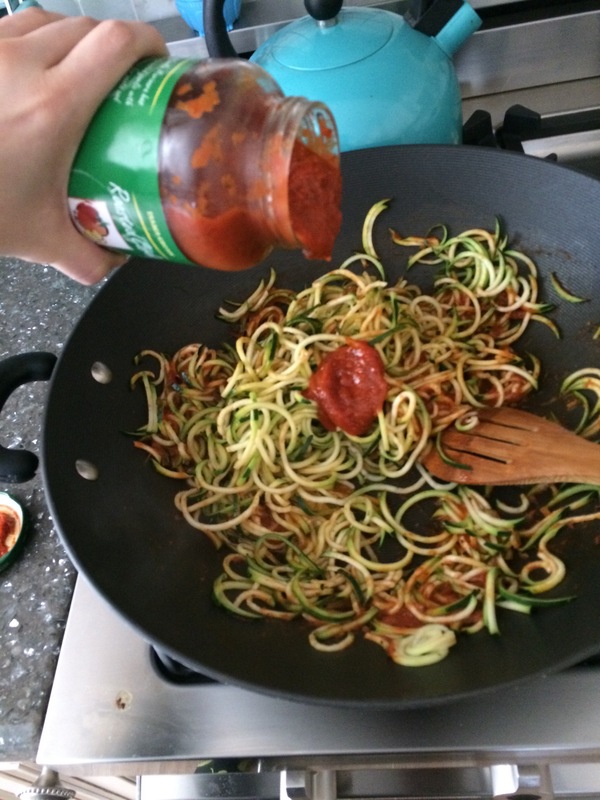 Once you get all the zucchinis you want spiralized, grab your favorite pasta sauce. 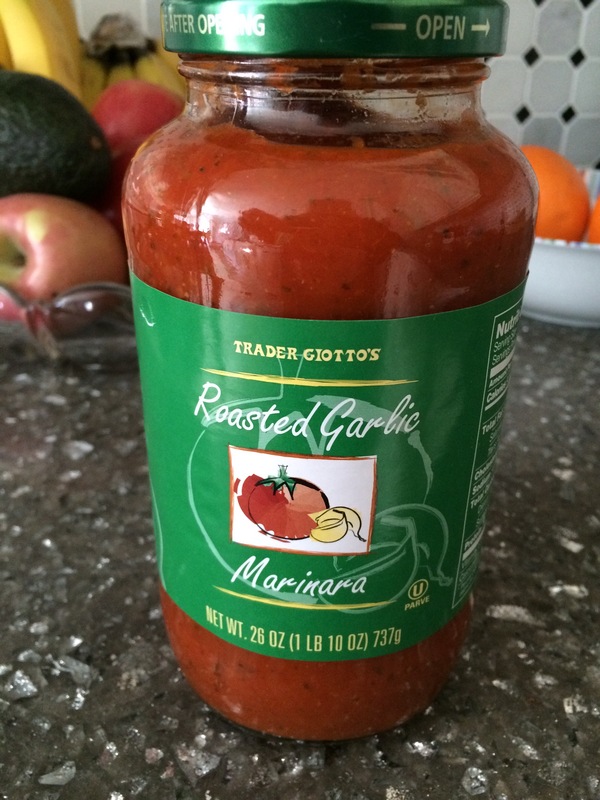 I used the Trader Joe’s Roasted Garlic Marinara. 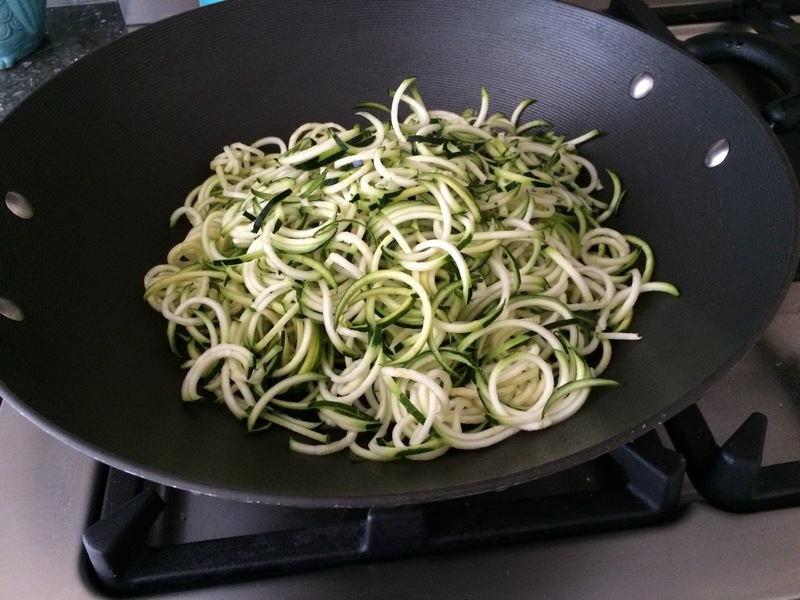 For the three zucchinis I spiralized, I only used about a quarter of the jar, if you spiralized more or just prefer more sauce, feel free to add more. 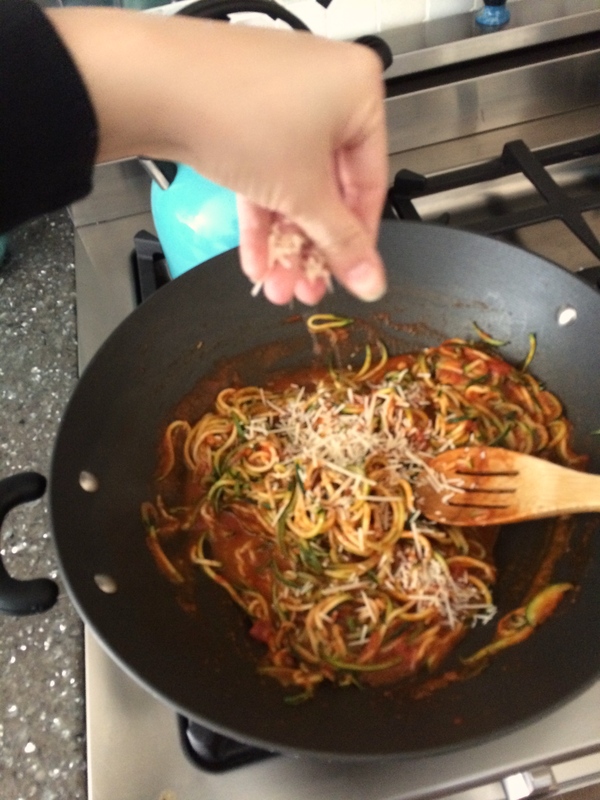 Then, just sauté the zoodles in the sauce until they are tender. 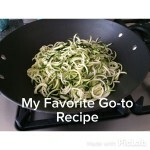 At this point you can add add-ins, such as cheese or different type of veggies. I added in some parmesan cheese, since I love cheese!! And that’s pretty much it!! 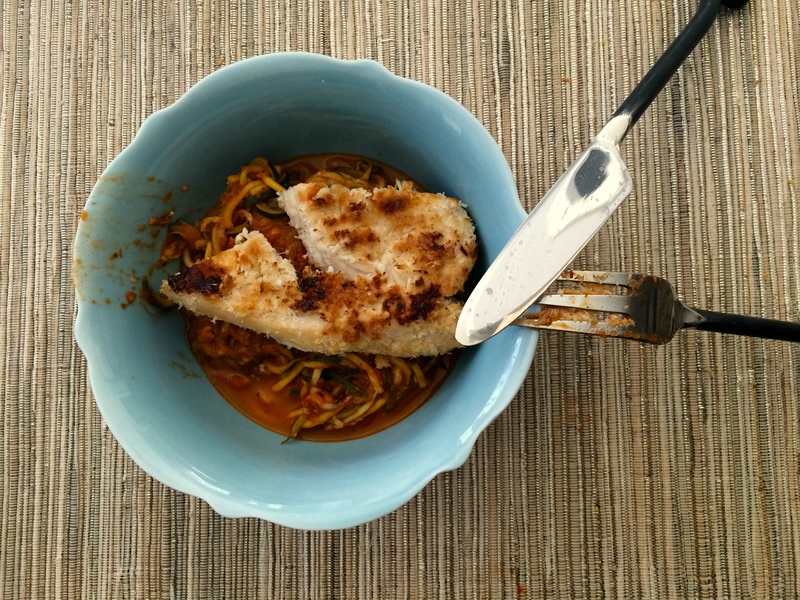 You can serve it your favorite protein, I just made some grilled chicken and BAM! Quick meal in just 20 minutes! Ok, lets talk about these cravings. I’m interested in finding out what types of cravings people have while they’re pregnant. For me it’s mostly been Juice, fruits, and Italian food. Not too shabby I guess! I am actually really surprised! I thought I would be the kind of person that would want cookies and ice cream since those are a few of my favorite things (I have a major sweet tooth!) If you would have asked me before I was pregnant if I wanted some ice cream, i’d say HECKKK YEAH! But now, I’m like, eh, no thanks. It’s so weird for me. I still really crave sweets sometimes. 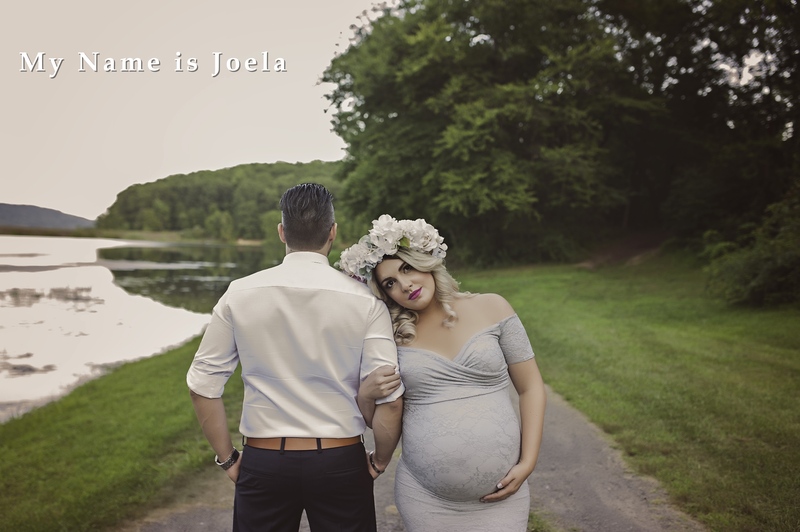 But, all I really want is some yummy, juicy oranges or grapes, or a very sweet fruit juice or smoothie, which by the way, my midwife says she doesn’t want me drinking too much of. Apparently, what I do have to drink more of is water. My midwife says that you need double the water a normal person would drink because you’re drinking for two!! 0_0 I’m trying, but it’s hard! Also, what about food aversions? It’s the strangest thing! At first, I couldn’t even look at coffee, but now I’ll have it a couple times a week when i’m in the mood for it. By the way, it’s totally safe to have 1 cup of coffee a day. 🙂 Thank God! In the first trimester, almost everything made me want to puke. So, I think I basically had an aversion to everything. And if you asked me what I wanted to eat, I couldn’t tell you because I would really have to say, “Nothing! Just give me something before i pass out.” LOL! That’s how bad it was! I wasn’t really a meat eater, mostly vegetarian before I got pregnant. I had to start eating meat because it’s really important that the baby gets enough protein. I really didn’t want to have to supplement and take more vitamins than I already do, or have to worry about eating 1 lb of brown rice or 2 lbs of spinach. (Those have protein in them in case you didn’t know, but i’m exaggerating on the amount 🙂 ). I haven’t really been enjoying the meat eating, chicken especially. The thought of it makes me want to “vom” and I have to force myself to eat it. I think I just prefer a steak or some fish, so I try to alternate. Enter your email address to subscribe to daily posts!